Who doesn’t love a good lighthouse, standing tall above the coastline to beckon ships in from the sea? In The Onion’s satirical alternate universe, President Trump doesn’t. The website known for lampooning current events has just published “The Trump Documents,” which paints a fictional picture of bizarre goings-on in Trump’s White House via dozens of “leaked” documents – like national security briefings presented as children’s activity placemats with word searches and pictures to color in. Among the documents is a dossier titled “The Lighthouse Question,” which chronicles Trump’s deepening paranoid delusions about the lighthouses we Mainers love so much. Through email exchanges, intelligence briefings and an executive order, we learn that Trump is convinced that lighthouses and their keepers are an urgent threat to national security. 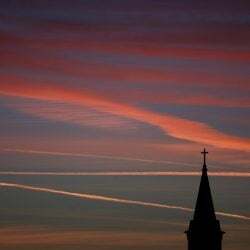 “He said that because lighthouses are all by themselves and face their lights away from the country, they are ‘unpatriotic,’ whatever that means. He also told me we have to find a way to ‘stop their beams’ probably about a dozen times,” reads an email from Jared Kushner. “He kept yelling that he was going to declare the U.S. Lighthouse Society a terrorist group and went on and on about how we have no way to stop their lights from rotating around in circles. I think he also said something about Americans needing to get their own spinning beams of light to fight back?” Kellyanne Conway writes. 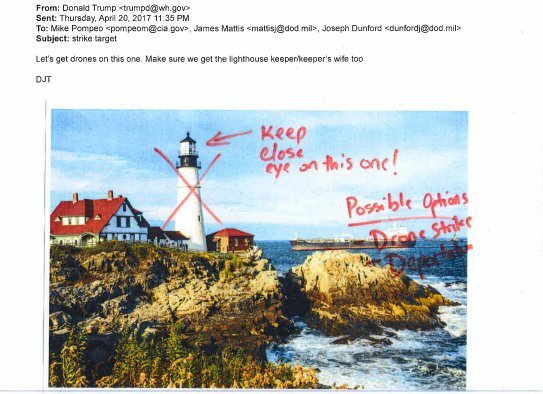 An email from Trump himself with the subject “strike target” includes a scanned photo of Portland Head Light with a red X drawn over it. “Let’s get drones on this one,” Trump writes. “Make sure we get the lighthouse keeper/keeper’s wife too.” Of course, any Mainer could have told him that a keeper hasn’t been in residence there since 1989. Cape Neddick Light in York is featured in a CIA presentation on “high-priority targets.” York residents, beware: It has been assigned Code Level Orange and will have an armed drone monitoring it 24/7. The last document in the series is an executive order authorizing the destruction of any threatening lighthouses on American soil, so our time to enjoy them may be limited. 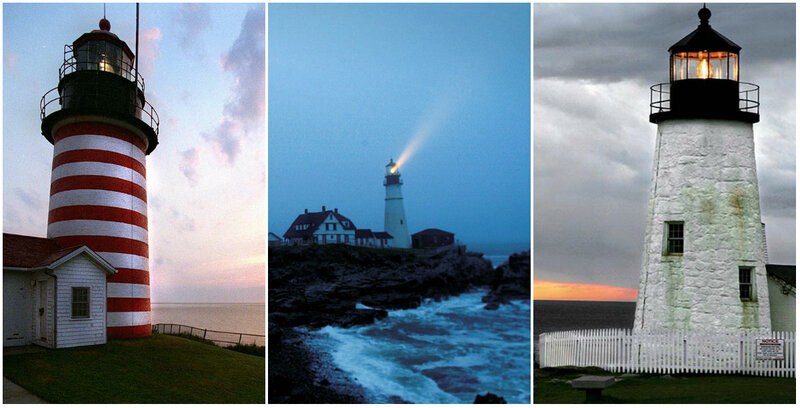 Quick, before the NSA catches on to us: Here’s a bunch of our favorite Maine lighthouse photos. See them while you can!